The Wauwatosa Mayfair Rotary Club was officially chartered on May 20, 1985. Sponsored by the Wauwatosa Rotary Club, our Club had 22 original members. Today, 9 of those original members are still active in the Club. Since 1985 the Mayfair Rotary Club has grown to a size in excess of 36 active, involved members. The purpose of Rotary is "to encourage and foster the ideal of service as a basis of worth enterprise, and in particular, to encourage and foster service." Our Club pursues this ideal of service through four avenues of activity: Club Service, Vocational Service, Community Service, and International Service. 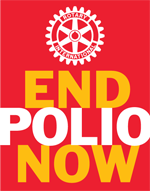 Club Service is fostered through our weekly meetings with fellow Rotarians. Our Rotary membership consists of a broad spectrum of job classifications, providing a diversity of backgrounds and expertise. Our weekly programs feature speakers from a variety of disciplines, and our regular social outings provide recreational outlets promoting Club fellowship. Vocational Service is highlighted through our involvement in the Business Education Network and our support of the statewide Business World and local Mini-Business World events. These programs attempt to bring Business and Education together, as well as to give our youth a better understanding of the business world and all its implications. We annually sponsor students for Badger Boys/Girls State, providing an introduction to the functions of government. Additionally, local high school students have the opportunity to visit our Club at weekly meetings. Community Service is promoted through our involvement in a number of civic programs. Our Club has an annual Easter Egg Hunt for children that draws well over 1,000 kids. We have maintained an active involvement with the Wauwatosa School System sponsoring college and vocational/technical scholarships for outstanding area students. The Jonathan Ryan Schroeder Grow Memorial Scholarship is awarded to a student pursuing a degree in the natural sciences. We support a number of local charitable and civic organizations, including the Mayfair Interfaith, the Boys and Girls Scouts, the Civic Alliance Post-Prom Party, the Milwaukee Health Education Center and the Wauwatosa Food Pantry. These activities are financed through our fund-raising efforts, including our annual Golf Outing as well as numerous "fines" to our Club members. International Service is embodied through our support of the Rotary Exchange Program, the Rotary Foundation and the local World Affairs Seminar for youth. We annually sponsor a foreign exchange student to enhance cultural awareness and provide an opportunity for a foreign high school student to experience the educational and social aspects of the United States. Our contributions to the Rotary Foundation fund projects on an international basis and promote goodwill to all nations. The World Affairs Seminar allows Wauwatosa area students to experience cultural diversity and human concern issues. The principles found in the "4-Way Test" underscore the commitment we ask of all members in their business and volunteer activities. The precepts simply ask, 1. is it the Truth, 2. is it Fair to all concerned, 3. will it build Goodwill and Better Friendships, and 4. will it be Beneficial to all concerned.